The Mongolian Children’s Mobile Library exists through the efforts of publisher and translator Dashdondog Jambyn, who takes children’s books by camel to nomadic herding communities and remote parts of the Gobi desert. 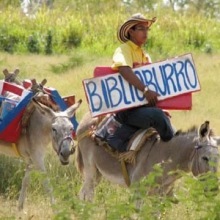 Mobile libraries around the world come in a variety of forms, including the “biblioburro” in rural Colombia, the M.S. Epos library ship in Norway, and elephant libraries in Thailand. In the States we are more familiar with the bookmobile on wheels. Historically, the first bookmobile was started in 1905 in Washington County, Maryland, by librarian Mary Lemist Titcomb. Her “Library Wagon” was horse-drawn and visited farms throughout the county. Mary Titcomb’s “Book Wagon”. Courtesy of the Washington County Free Library. Bookmobiles today have become hi-tech but their mission has not changed–bringing reading materials to areas not served by a library or to groups of people who are not able to readily visit the library. They often provide computers with Internet access, e-readers, and even video game systems. 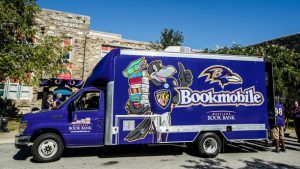 Here in Baltimore, the Ravens football team have a bookmobile funded by the Ravens Foundation and operated in partnership with the Maryland Book Bank. In 2017, the Bookmobile distributed 93,000 books to more than 18,000 students across Baltimore City. With bookmobiles, libraries are able to increase the scope of their community involvement. Enoch Pratt Library has their Mobile Job Center. The Center features computer work stations and books, as well as staff to provide information and assistance for job seekers. It travels around the city to neighborhoods where unemployment is high. So on National Bookmobile Day, which is traditionally the Wednesday of National Library Week, let’s pay homage to these mobile libraries and to the wonderful people who staff them! This entry was posted in Uncategorized by Deborah Li. Bookmark the permalink.